Pachytheca – a nematophyte propagule ? 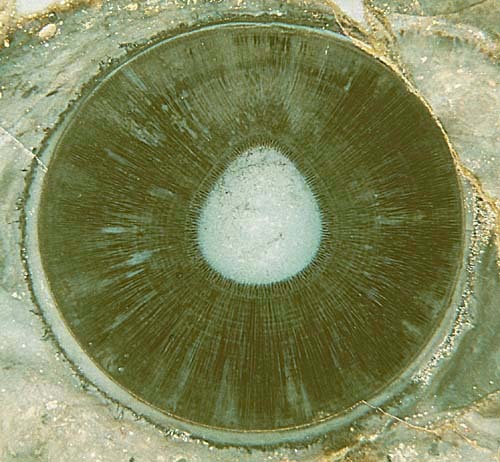 The pea-size spheres known as Pachytheca, found in the Silurian and Lower Devonian worldwide, had been interpreted in various ways [1,2], most recently as nematophytes, and put under the heading "Enigmatic Organisms" , which adds to the fascination emanating from this fossil which seems to defy proper classification. 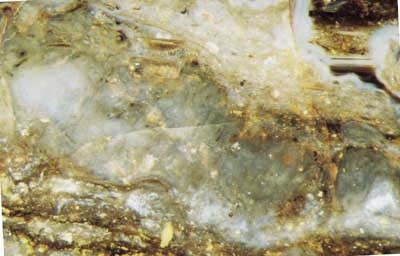 Fig.1 (right): Pachytheca in Rhynie chert, central section. Note the "hairy" coating along the circumference and the very vaguely seen remains of nearby tubes (?) above left. Diameter 3.8mm. 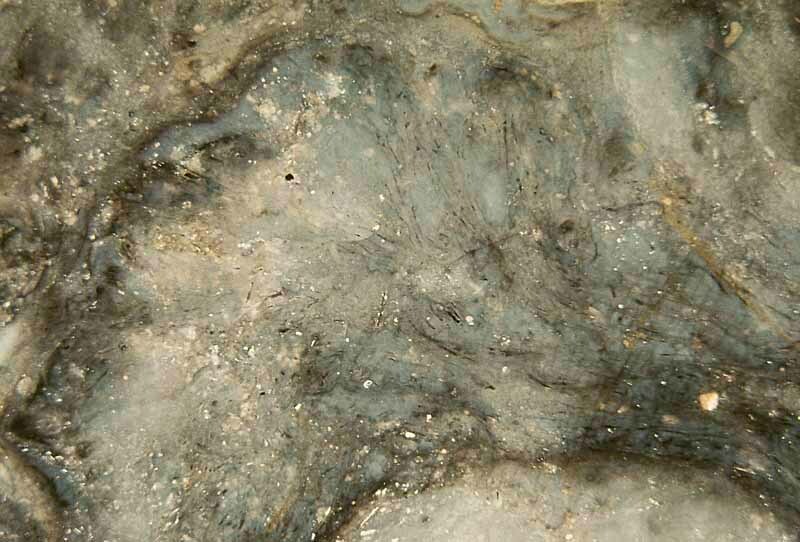 Fig.2 (below): Pachytheca in Rhynie chert, off-centre section. Note the preferential inclination of the "hairs" towards the right. 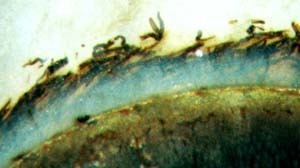 Fig.3 (right): Irregular-shaped whitish layer (above left to below right) with poorly preserved tubes, diameter about 40-80µm, some with dark fill, vaguely seen in the chert sample within 2cm distance from Pachytheca. Width of the picture 6mm. Fig.4 (below): Bounded patch in the chert sample at 1cm distance from Pachytheca with poorly preserved tubes whose presence is indicated by discontinuous dark fills. Width of the picture about 8mm. The hairy coating seen in Figs.1,2 , taken together with the other observations, suggests the idea of an intimate connection between Pachytheca and filamentous structures typical for flat nematophytes. Taking this for granted, one arrives at the conclusion that Pachytheca possibly is a small compact part of a larger nematophyte "body" with less well defined shape and structure, which leads to the question what could be the reason why a nematophyte invented a body part of such highly symmetrical shape and structure. Apparently, the mechanically most stable and drought-resistant structure which can be obtained with the few components available to nematophytes, namely tubes, gel, and cuticle substance, is the one realized by Pachytheca: a thick spherical shell consisting of radially arranged tubes of one size, glued together by gel, forking such that they keep densely packed, and forming a nearly perfect sphere with a cuticle covering the whole. Such compact structure differs much from that of nematophytes with loosely arranged tubes. Since physiological processes are based on the exchange of substances by diffusion, the compact structure seems unfavourable in a similar way as seeds and bulbils are unsuitable for sustaining physiological activity. They are adapted to standing hardships while dormant, which makes them suitable for survival and distribution. Pachytheca could have served the same purpose, as a hardy nematophyte propagule, mechanically so strong that it usually remained spherical while everything else in the sediment became compressed. It can be assumed that such strength had been advantageous. Hence, it seems worthwhile looking for propagules of other nematophytes. Also the idea suggests itself that the different types of Pachytheca, if they really are propagules, represent different nematophyte species. Annotation 2016: Although nematophytes may appear as tangles of tubes in whitish clouds with dark boundary (see Rhynie Chert News 98), new observations suggest that the present Figs.3,4 probably show some undescribed alga incidentally grown near Pachytheca. Grondboor & Hamer 58(2004), 52-57. H. Steur: Pachytheca, a strange, vegetable little sphere. T.N. Taylor, E.L. Taylor, M. Krings : Paleobotany, Elsevier 2009.